I know, I konw.. the weather here in the Philippines has gone bonkers! Its super hot and sunny one moment then bam! The sky suddenly darkens. The air suddenly becomes hot, sticky, and humid (which by the way really gets to me coz it triggers my asthma. I swear, I know now when it will rain coz I suddenly start wheezing.. >> scary but useful!). Then lightning, thunder, then the whole cats and dogs and water comes splashing down. And now, classes have been suspended. Thankfully they announced this early so I don't have to worried about getting home or get drenched as I commute home. I know there are probably other commuters out there who share the same dilemma with me, SAVING YOUR SHOES! I know, I know.. its tough! The weather is so erratic that the shoe you wore to work might not survive on your way home due to the rain. I remember one really bad day where my shoes were ALREADY SOAKED. I hated it and I knew that if I continue it would really be ruined. I had to run to a nearby shoe outlet that were selling rubber slippers before I continued commuting home. So ever since then, I followed one of the recommendations of one of my friends! Let me introduce to you my new rainy day shoes - JESSICA! Its now my favorite pair of travel rubber flats! Its super affordable only Php199 and can be found in our favorite department store - SM! Since its rubber, you have absolutely no fear in walking in puddles, getting your shoe splashed and drenched on, and having it ruined because it can stand the weather! 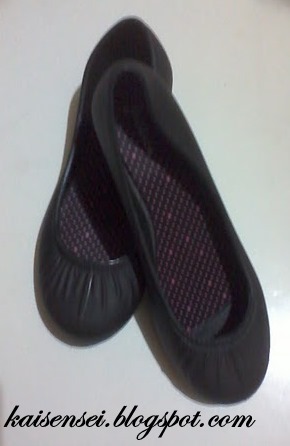 Plus, it doesn't look like the typical rubber flats (croc imitations). It looks cute and durable. Which is the most important part eh? Check out the "Jessica" line. They have other awesome "rubber" stylish shoes being sold at SM Department Store. Practical and stylish. Need I say more? So coffeeholics, the rainy season is here to stay. Go get your "Jessica" and save your shoes from water abuse! Go na!